On the final day of competition at the BRITS 2019, Britain’s best freestyle skiers and snowboarders took on the world famous Laax snowpark, riding together in what was a BRITS first. 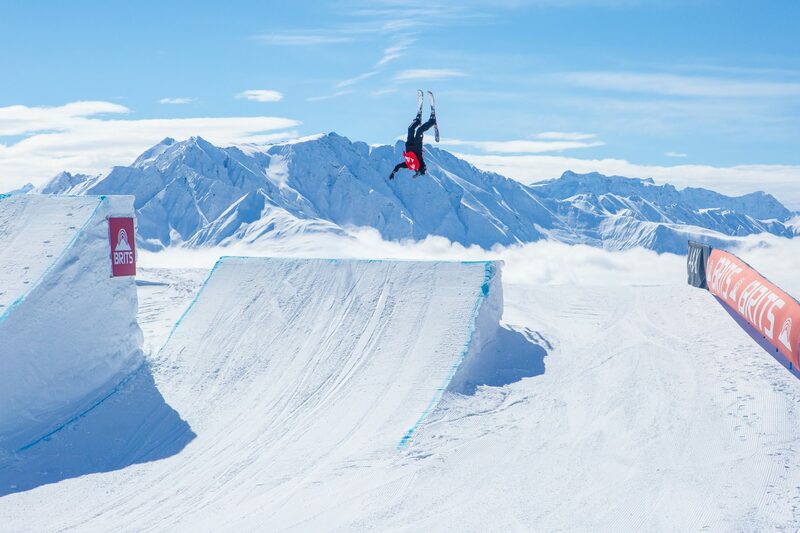 Coming out on top in the snowboard event were big air champ Mia Brookes, and GB Park andPipe star Matt McCormick, while Tom Greenway and Amy Clayton capped off perfect weeks in Laax to claim ski slopestyle golds. After a huge snowfall on Wednesday that meant competitions had to be cancelled, the final day of the BRITS saw competitors nervously awaiting news of whether the ski and snowboard slopestyle contests would go ahead. Down in the valley, the clouds were thick early in the morning, but climbing through the clouds towards the top station and the Laax snowpark, the weather cleared, giving stunning views over a powder paradise. With around 110cm predicted to have fallen, park shapers faced a gargantuan task in clearing the thousands of tonnes of snow that laid across the park. However they did so impressively, and by the time the competition began, the best slopestyle course in the world was running perfectly. A rail section, a side-hitable roller and two kickers tested the riders’ slopestyle skills, and skiers and snowboarders rode together, giving the contest an incredible sense of community. Tom Greenway and Amy Clayton both pair swept to big air glory in a weather-affected competition on Wednesday, and following the cancellation of halfpipe yesterday, both were raring to go and returned on top of the slopestyle podium. In the ladies’ event, 14-year-old Amy Clayton (pictured below) produced a 98-point final run and marked herself as a star of the future on a course reduced due to the conditions. The men’s competition saw some of Britain’s best going head-to-head. With Tom Greenway and Chris McCormick earning two of the highest scores in qualifying, it was clear that the pair would be locking horns to see who claimed the gold. Greenway – who emulated McCormick’s 2018 performance by taking the big air-slopestyle double – threw switch tails 270-on 270 off followed by a hand drag 3, left double 12 safety and finished it off with a switch dub 9 safety to earn a commanding 94 point score and a safe margin of victory. Matt McCormick, who narrowly missed out on the big air title two days ago, came out swinging from the off. His first run was the best run of qualifying and saw him cruise through to finals as the number one seed. He then stepped up the difficulty to lock down a huge score in the last run of the day, a BS double cork 1080 mute to cork to 720 truck driver in the kickers which was head and shoulders above the competition. The rest of the men’s podium was a family feud, as brothers Harry and George Waite battled it out. Seniority appeared to prevail as older brother Harry took the silver ahead of George in third. In the women’s contest Mia Brookes continued her dominance on the podium. In all disciplines, her short stature and tender age has had no bearing on her performance. Speed, style and amplitude has been in abundance all week, and today was the icing on the cake. Switch BS boardslide 270, Cab 360, Cab540, BS 720 was Mia’s final run, and no one could get close when she landed it cleanly. Settling for silver was last year’s champion Cerys Allen. Allen did attack the biggest kicker on the mountain, but wasn’t able to complete a run as technical or clean as Brookes. Surprised to hear her name called, and obviously ecstatic to score her first overall podium spot, 14 year old Amy Casswell took Bronze.